I turn to see someone that looks like a pop star who’s having a bit of a career hiatus. With overly gelled, spiked hair and the beginnings of a loosening jowl, Mr C made every effort to be on trend, that’s if style was solely influenced by the nineties. There is something disarming about Mr C’s charm. A hard backed villain like myself should not be seen dead talking to a screw, but in his own way Mr C defiantly defied most of the conventions of what a prison officer should be. He is indiscrete where his colleagues are tight lipped, he is genial where others are starchily professional, he cares when others have given up on caring and in some cases have given up on themselves. “Gov, you know that being white, all that pimp walking and slang might be taken the wrong way.” I say this while trying to maintain a stern face and suppress a smile. 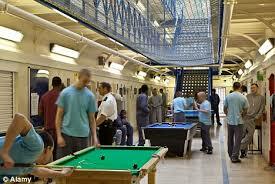 The fact that Mr C takes the time to ask why and does everything within his power to make the lives of those in his care better, holds him in good stead with the inmates, if not necessarily his fellow prison officers. I have seen the occasional looks of contempt shot in his direction by officers who feel he is ‘too close’ to the cons in his charge. The thing about Mr C is that he is no bleeding heart liberal. I know nothing of his political persuasion or his thoughts about the criminal justice system and the rights and wrongs of imprisonment. But I do know that his every action is governed by decency; he is a good-natured man working in an environment where the importance of mutually respectful relationships has somehow been lost. Mr C is old school; from back when the prison population was smaller and staff numbers larger than they are now. Officers appeared to have the time to develop positive relationships with those under their supervision. Now, it’s not unusual to see Mr C with his fingers in the dyke, trying to prevent the chaos that breaches the rare interludes of calm. I’m sure that he sometimes feels like an under-siege parent having to deal with 200 demanding ‘children,’ all of who believe that their needs trump the other 199. He is the squeezed middleman damned by his managers and by those in his charge, because he is the ’go to man’ – the man that gets things done. Even though he may be hard pressed for time, Mr C has a habit of taking vulnerable men under his wing and giving them guidance, often getting me involved. “Paul, do me a favour buddy. There’s a lad in cell 23; he’s struggling. Can you have a chat with him?” I could never decline a request from him, as he does for others what he previously did for me. He showed me compassion when I felt I was deserving of none. Tags: defied convention of what a prison officer should be, see beyond the uniform, why work in prison environment? MORE!! You create such a beautiful character, this feels like the introduction of a book, you can’t stop there, what about the rest of the story?